The perfect solution for many parties & events! 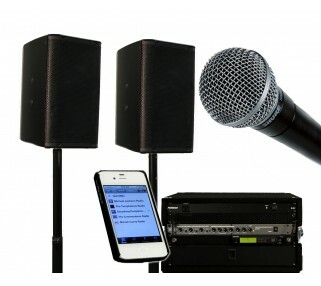 MC your event with a wireless mic and play music from your iPod, iPad, iPhone, Android Device or laptop. The iPod Sound System rental is perfect for weddings, birthdays, holiday parties and more. 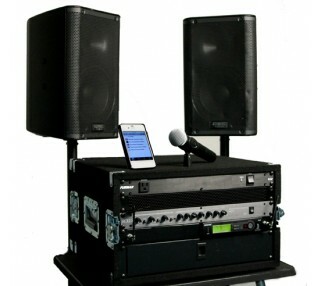 This exclusive Avista product is an all-in-one sound system that offers a wireless microphone for announcements and speeches and also allow music to be played using an iPod, iPad or computer. While this iPlay Sound System is easy-to-use and portable; it is thoroughly professional grade, featuring high quality components from industry leaders Shure, Mackie and QSC. The iPlay system is all setup in a hard shell case: simply power everything up, put the speakers on stands, connect the audio cables, and you are up and going. We even include extension cords to make setup easy. 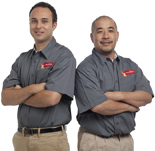 If you choose to pickup your iPlay rental, an Avista technician will walk you through everything you need to know to setup and use the iPlay Sound System. At an additional charge, you can choose full service delivery and setup for worry-free operation.